VANCOUVER, British Columbia (GLOBE NEWSWIRE) – MGX Minerals Inc.(“MGX” or the “Company”) (CSE: XMG / FKT: 1MG / OTCQB: MGXMF) is pleased to report completion of the previously announced Time Domain Electromagnetic (TDEM) survey at the Salinitas lithium brine project (the “Project”) located in the Salinas Grande Salar of northwest Argentina. The TDEM geophysical survey was conducted across 52 stations at 500 meter totaling approximately 26 kilometers. Data compilation is underway and interpretation is expected to begin shortly. Based on interpretation of the TDEM data, the Company is now preparing to carry out trenching as well as an auger drilling program to test for shallow, near surface brines that contain anomalous concentrations of lithium and other elements correlated with geophysics in preparation for definition of drill targets. The Salinitas tenements are located in the lithium triangle at the Salar de Salinas Grandes, in the Province of Salta. The 4,308 hectare contiguous land package resides in the Puna region of northwest Argentina near the border of Chile, an area renowned for its lithium- and potassium-rich brine resources. MGX has partnered with A.I.S. Resources (AIS.V) on the Project and is currently earning an undivided 80% interest by incurring total exploration expenditures of at least US$1.2 million by May 31, 2020 and by making payments totaling US$3.2 million which are primarily due at that time. With the impending advent of the widespread use of electric cars, trucks plus the millions of rechargeable consumer electronic devices that utilize lithium ion batteries, it is no wonder that numerous exploration companies have turned their attention to the vast Lithium Triangle in Argentina, Chile and Bolivia. 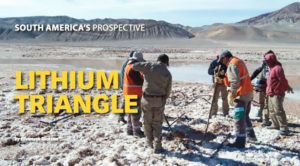 It has been estimated that South America’s Lithium Triangle hosts about 54% of the world’s lithium resources. Exploring Argentina Lithium & Energy’s 20,500-hectare Arizaro Project in northwest Argentina. Photo courtesy Argentina Lithium & Energy Corp. Most of the world’s lithium has been produced by an oligopoly of producers – often referred to as the Big Three – Albermarle Corp. [ALB-NYSE], private Sociedad Quimica y Minera de Chile (SQM), and FMC Corp. There are two sources of lithium – hardrock (the mineral spodumene) and lithium brines that formed in desert climates where there is a slow inflow of lithium and other metals and salts but no outflow. Gradual evaporation over thousands of years slowly increases lithium grades to an economic level. A recent report by Global Market Insights, Inc. concluded that the global lithium ion battery market is set to surpass US $60 billion by 2024 with a global market of 534,000 tonnes of lithium carbonate by 2025. Some lithium mining operations are already producing the world’s lightest metal from brines. In partnership with Toyota Tsusho Corp. and JEMSE, Orocobre has built and is now operating the world’s first commercial, brine-based lithium operation constructed in approximately 20 years. During 2016, Argentina’s two working mines produced 11,845 tonnes of lithium carbonate, or approximately 6% of global output. For 2017, output is about 17,500 tonnes. 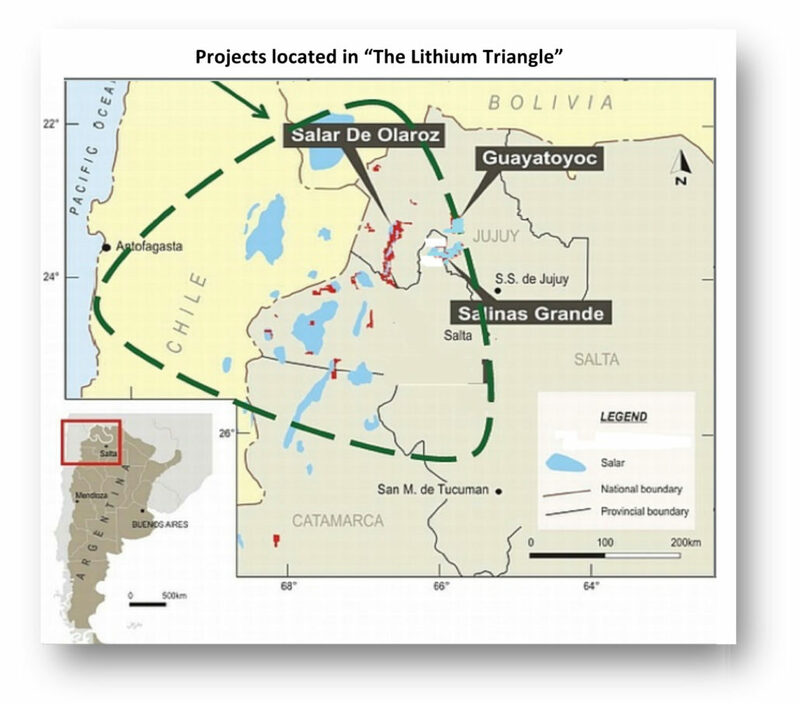 Map shows Lithium Triangle located in Argentina, Bolivia and Chile. In Chile, the Salar (Spanish for salt lake) of Atacama, contains about 27% of the world’s lithium reserve base and provides almost 30% of the world’s lithium carbonate supply. 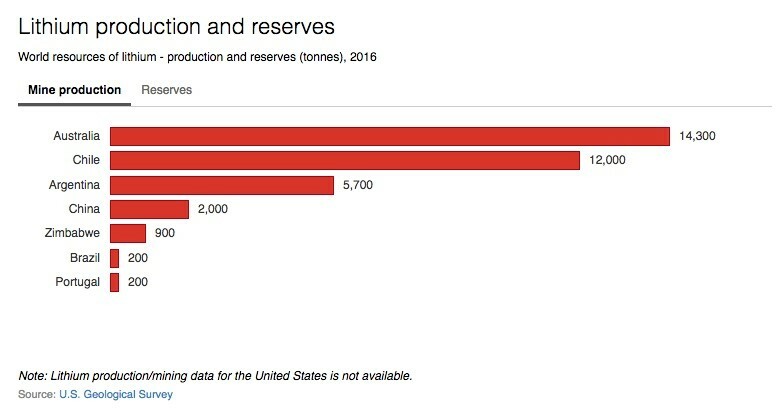 Chile is the most advanced country with regards to lithium extraction, followed by Argentina. On the other hand, it is early days for Bolivia. During a recent presentation in Vancouver, Cesar Navarro Miranda, Minister of Mining and metallurgy for Bolivia, told the audience that the mining sector supports 37% of his country’s population. His government is keen to attract foreign exploration and mining companies by offering various incentives as well as political and economic stability. Joseph Grosso, a director of Argentina Lithium & Energy, and an officer of Golden Arrow Resources and Blue Sky Uranium, all with projects in Argentina, has been active in the country since 1993. In addition, to being part of a team that made mineral discoveries, he has been a pioneer in developing the Argentine mining industry. There is a major question that haunts lithium explorers, miners and lithium stock investors. While increasing demand has boosted lithium prices from US $350 to $3,000 per ton in the past five years, there is uncertainty as to how quickly and how much the electric vehicle market will require. With so many lithium explorers out there seeking economic deposits, plus lithium producers ramping up production, there is no doubt there will be a great deal of lithium supply available. 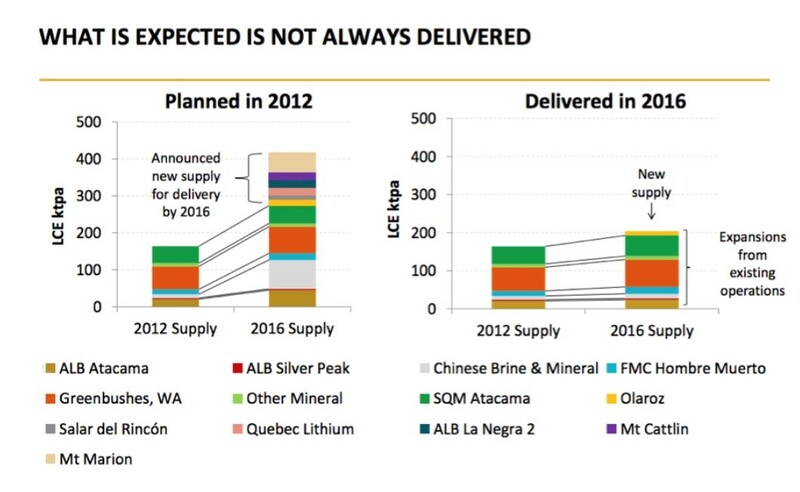 Will that result in an oversupply that will drive lithium prices down? A recent Morgan Stanley report thinks so. On the other hand, major auto manufacturers such as Volvo, Volkswagen and the China’s BYD are betting on mass acceptance of electric vehicles, each with their 30 kilograms of battery lithium, as vehicle prices come down and range anxiety issues are solved. Here is a pertinent question: if the Tesla Semi electric truck is successful, and other sizes of electric trucks are successful too, could this lead to tremendous worldwide sales of trucks? For example, there are some 15.2 million trucks in the US alone with 2 million of them being Semis. Translate that to the rest of the world and the numbers are huge. So what will lithium demand be as well as the demand for the other battery minerals such as cobalt, manganese, copper and graphite? Below are details on companies active in South American Lithium Triangle. AIS reported seismic testing has detected three distinct aquifers over a broad area at its Chiron Project in the Pocitos Salar, Salta Province, Argentina. AIS has also completed the mass balance chemistry and process engineering that will be used to determine the raw materials used to purify the lithium brines from its Guayatayoc Project. The data will be used in the design, engineering, and construction of an 810,000 tonne lithium carbonate plant. The analysis used fractional crystallization and ion exchange resins to purify the lithium carbonate to higher than 99.5% lithium carbonate. The work was conducted in Salta and will be replicated at Guayatayoc to ensure that the reduction in air pressure has no material impact. Advantage Lithium Corp. [AAL-TSXV; AVLIF-OTCQX] has received encouraging assays from its 75% owned Cauchari Project in Jujuy Province, north-west Argentina, about 20 km south of Orocobre’s flagship Olaroz lithium facility. At a brine flow rate of 19 litres/second, there was 515 milligrams/litre lithium and 4,577 milligrams/litre potassium in hole CAU11 in the SE sector. David Sidoo, President and CEO, said, “This excellent flow rate and lithium grade in hole CAU11 confirms the potential of the SE sector, with the drilling program continuing to provide additional information on the salar geology and brine both laterally and at depth.” The company has 100% interests in five other projects in Argentina. Alba Minerals Ltd. [AA-TSXV; AXVEF-OTC] is exploring its 2,421 hectare Quiron II property in the Pocitos Salar, Salta Province, Argentina. The company identified a probable lithium brine aquifer at the road accessible Quiron II property through interpretation of a Vertical Electrical Sounding (VES) survey. Alba has an option to earn a 100% interest in the 2,843 hectare Chascha Norte Project in the southeastern part of the Salar de Arizaro, Argentina, the largest yet unknown Salar in this district. Argentina Lithium & Energy Corp. [LIT-TSXV; PNXLF-OTCQB; OAY1-FSE] has an option to earn a 100% interest in the 20,500 hectare Arizaro Project in northwest Argentina. The road accessible project is near power and rail. Geochemical, electrical surveys and three test holes have been completed. The company has a 100% interest in the Incahuasi Project in Catamarca Province, Argentina with another 10,000 hectares under application. These projects are being prepared for drilling programs. 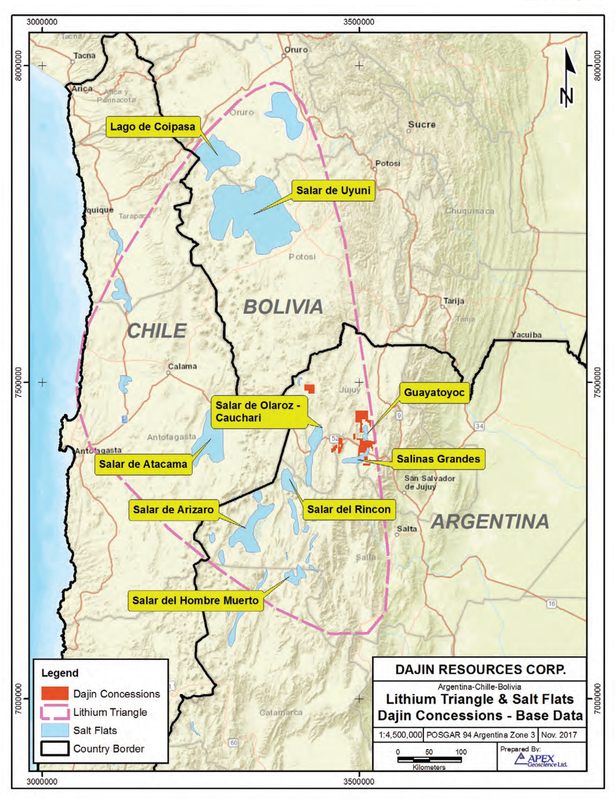 Dajin Resources Corp. [DJI-TSXV; DJIFF-OTC; A1XF20-FSE] has a strategic partnership with LSC Lithium Corp. in Argentina and has over 93,000 hectares of land holdings. Under the agreement, LSC Lithium has access Enirgi Group’s state-of-the art Direct Xtraction Process (DXP) technology for lithium brines The Enirgi Group has a demonstration plant at Salar del Rincon, Argentina that produces lithium carbonate. Surface sampling on the Salinas Grandes LSC/Dajin JV property of San Jose/Navidad has been completed. Surface pit sampling was conducted as part of the first phase of exploration. High grades were confirmed with concentrations ranging from 281 milligrams per litre (mg/L) to 1,353 mg/L lithium, averaging 591 mg/L. 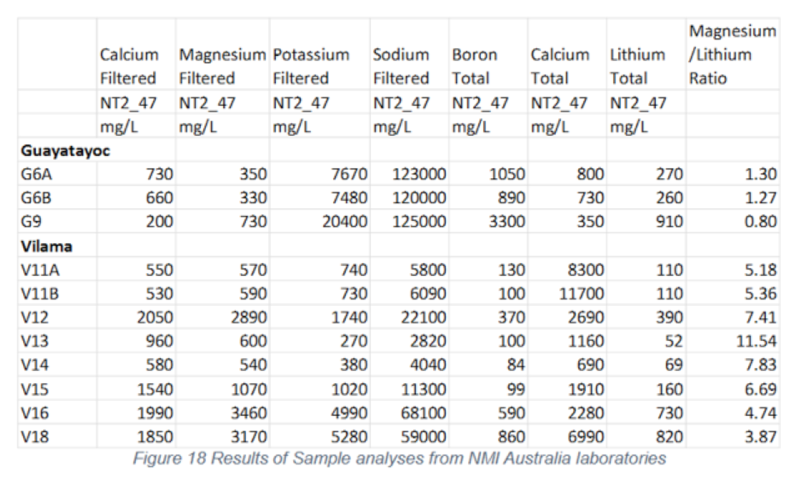 A total of 60% of assays were over 500 mg/L lithium and 8% over 1,000 mg/L. FMC Corp. [FMC-NYSE] reported that its lithium segment earnings were US $44 million for Q4 2017, up 107% versus Q4 2016. 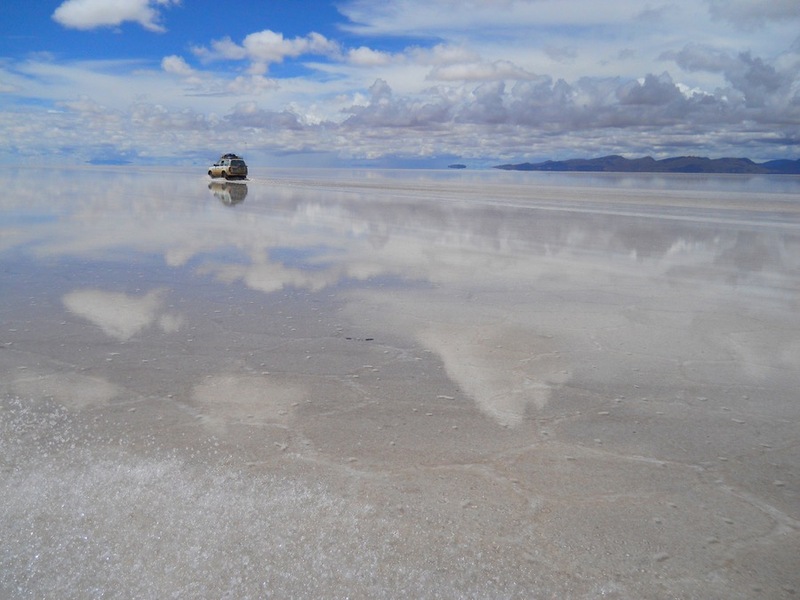 The company produces lithium from the Salar de Hombre Muerto salt flat in northern Argentina. Galaxy Resources Ltd. [GALXF-OTC; GXY-ASX] is advancing the Sal de Vida (Salt of Life) deposit in northwest Argentina, one of the world’s largest and highest quality undeveloped lithium brine deposits with significant expansion potential. In April 2013, Galaxy released a Definitive Feasibility Study which supports a low cost, long life lithium and potash operation. The study estimated a pre-tax Net Present Value of US $645 million (US $380 million post-tax) at 10% discount rate. Sal de Vida has the potential to generate total annual revenues in the region of US $215 million and operating cash flow before interest and tax of US $118 million per annum at full production rates. International Lithium Corp. [ILC-TSXV; ILHMF-OTC] and JV partner, Mariana Lithium Co. Ltd., a subsidiary of Jiangxi Ganfeng Lithium Co. Ltd., announced a 2018 budget for continued work at the Mariana lithium brine project in Salta, Argentina. Highlights of the US $17 million budget include continued natural evaporation studies; membrane separation studies; aquifer characterization studies; Preliminary Economic Assessment; and Pre-Feasibility Studies. Lithium Chile Inc. [LITH-TSXV] has identified a 60+ km2 lithium brine target area at its Helados Project in Chile. The openended, low resistivity zone was discovered by transient electromagnetic surveys within the northwest-trending axis of the Salar Tara Laguna Helada basin. This area displays the same characteristics as the lithium-rich principal aquifers at Salar de Atacama, home to the world’s largest and highest-grade lithium brine mine. The company is preparing for an ini-tial drill program. LiCo Energy Metals Inc. [LIC-TSXV; WCTXF-OTCQB] is earning a 60% interest in the 160 hectare Purickuta Project and is one of a few “exploitation concessions” granted within the Salar de Atacama, Chile. The property is contained within an existing exploitation concession owned by SQM, and is approximately 3 km north of the exploitation concession of CORFO (the Chilean Economic Development Agency). About 22 km southeast of Purickuta, both SQM and Albemarle have large-scale production facilities within the CORFO concession which collectively produce over 62,000 tonnes of lithium carbonate equivalent annually and accounts for 100% of Chile’s current lithium output. Lithium Americas Corp. [LAC-TSX, NYSE; LACDF-OTCQX] has a 50/50 JV (Minera Exar) with SQM to develop the Caucharí-Olaroz lithium project in Jujuy, Argentina. The Cauchari-Olaroz pond layout and design have been completed with the pond contractor mobilized at site and production pond construction scheduled to start shortly. Minera Exar has reviewed the development schedule for Cauchari-Olaroz and expects first production to begin in 2020. Lithium Energi Exploration Inc. [LEXI-TSXV; LXENF-OTC] recently acquired three Argentine corporations, Lithium Energi Argentina, S.A., Antofalla North, S.A., and Antofalla South, S.A., which together hold a portfolio of projects encompassing over 128,000 hectares of lithium brine concessions in Catamarca Province in the heart of the Lithium Triangle, spe-cifically Laguna Caro, Antofalla North and Antofallo South. Lithium X Energy Corp. has completed a merger with NextView New Energy Lion Hong Kong Ltd. whereby all of the issued and outstanding common shares and warrants of Lithium X were acquired by NextView’s wholly-owned British Columbia subsidiary, NNEL Holding Corp. The company’s 100% owned flagship project is the Sal de Los Angeles lithium brine project, Salta, Argentina. The project comprises about 8,748 hectares of Salar de Diablillos and has a NI 43-101 indicated resource estimate of 1,037,000 tonnes of lithium carbonate equivalent and 1,007,000 tonnes of lithium carbonate equivalent inferred. LSC Lithium Corp. [LSC-TSXV; LSSCF-OTC] has filed a Technical Report on the Salar de Pozuelos Project, Salta Province, Argentina. The NI 43-101 resource estimate includes 1,296,000 tonnes of lithium carbonate equivalent in the measured and indicated resource category and 497,000 tonnes inferred. The company has a land package portfolio totaling approximately 300,000 hectares that includes the following projects: Pozuelos, Pastos Grandes, Rio Grande, Salinas Grandes, and Jama. Also, see Dajin. Millennial Lithium Corp. [ML-TSXV; MLNF-OTCQB; A3N2-FSE] has filed a Preliminary Economic Assessment for the Pastos Grandes Project, Salta Province, Argentina that was prepared by consultants WorleyParsons. The NI 43-101 resource includes 2,131,000 tonnes of lithium carbonate equivalent and 8,141,000 tonnes of potash equivalent in the measured and indicated resource categories, plus 878,000 tonnes of lithium carbonate equivalent and 3,263,000 tonnes potash equivalent inferred. Neo Lithium Corp. [NLC-TSXV; NTTHF-OTCQX] has discovered a new aquifer at depth at its 3Q Project in Catamarca Province, Argentina. “It adds considerable blue sky to the 3Q Project,” said Waldo Perez, President and CEO. This season, the company focused on completing infill drilling and getting into the deeper part of the basin. 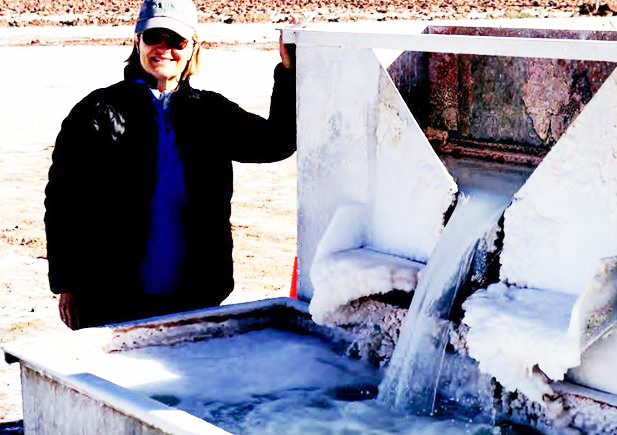 The company also reported that processing studies have achieved concentration levels of 3.8% lithium brine solely through solar evaporation – no costly additives were required, plus calcium chloride precipitates through crystallization and in the process captures water molecules within the crystals – both of these represent important developments for the project. NRG Metals Inc. [NGZ-TSXV; NRGMF-OTCQB; OGPN-FSE] has awarded a contract for the initial diamond drilling at its Hombre Muerto North lithium project in Salta Province, Argentina, to AGV Falcon Drilling SRL. The initial phase of drilling will consist of three core holes up to a maximum depth of 400 metres depending upon results obtained. Drilling is expected to start early April. The project is located at the northern end of the prolific Hombre Muerto salar, adjacent to FMC’s producing Fenix lithium mine and Galaxy Resources’ Sal de Vida development stage project. The Fenix Mine is the largest producing lithium mine in Argentina and the Sal de Vida Project is the largest devel-opment stage lithium project in the country. Orocobre Ltd. [ORL-TSX; ORE-ASX] is the newest brine based global lithium carbonate supplier through its flagship operation, Salar de Olaroz. Measured and indicated resources are 6.4 Mt LCE capable of sustaining current continuous production for 40-plus years with only ~15% of the defined resource extracted. Orocobre also has a 35% interest in Advantage Lithium. Ultra Lithium Inc. [ULI-TSXV; ULTXF-OTC] has received assay results of the second round of sampling work carried out in December 2017 on the Salar Laguna Verde discovery zone in Catamarca Province, Argentina. Assay results indicate lithium values in the range of 34.2 to 1,270 milligrams/litre or parts per million (ppm), magnesium values less than 1 ppm to 7,920 ppm, potassium 804 ppm to 15,800 ppm, and boron 65.5 to 2,190 ppm. Wealth Minerals Ltd. [WML-TSXV; WMLLF-OTCQB; EJZ-FSE] is completing drilling at the Laguna Verde Project, northern Chile. Bench-scale testwork demonstrated Tenova Advanced Technologies’ process technology could be successfully applied to Laguna Verde brines. Wealth signed a JV agreement with stateowned National Mining Company of Chile (Enami) to develop and commercialize Salar de Atacama and Laguna Verde as to Wealth 90%/Enami 10%. Wealth also holds Trinity, Five Salars and other projects in Chile. 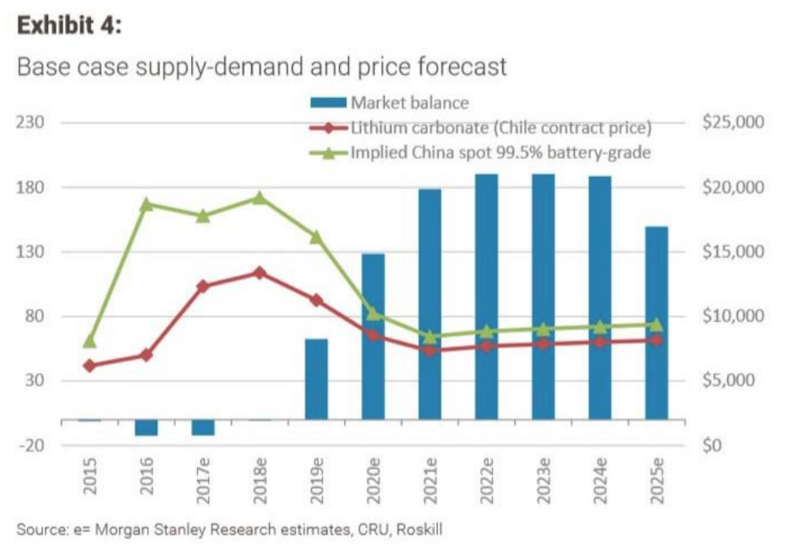 USA News Group – The future of lithium production within South America’s prolific Lithium Triangle is in the balance, as Chile has sent a strong message to China that the nation won’t sell off the majority of its lithium stake. Meanwhile, neighbouring Argentina plays catch up by opening itself up more to the global economy in the aftermath of its own far-left hangover. The result has been heightened by interest in the activities of companies operating in the Lithium Triangle, including Albemarle (NYSE: ALB), Lithium X Energy Corp. (TSX.V: LIX) (OTC: LIXXF), Orocobre Limited (TSE: ORL) (OTC: OROCF), Sociedad Quimica y Minera de Chile (NYSE: SQM), and A.I.S. Resources Limited (OTC: AISSF) (TSX.V: AIS). While on its way out the door, the deposed leftist Chilean government left quite a mess for the incoming pro-business elect to deal with-by summoning antitrust authorities to block the possible 32% purchase of Sociedad Quimica y Minera de Chile (SQM) by Tianqi Lithium Corporation out of China. The deal was worth a reported US$4 billion, and once ratified, would leave Tianqi and SQM controlling 70% of the global lithium market. However, the resistance in Chile has somewhat led to a shift of focus toward neighbour Argentina, which shares dominion over the continent’s renowned Lithium Triangle brine basins. There was considerably less resistance when Lithium X Energy finalized the sale of its Argentinean interest in an all-cash deal worth $265 million to Chinese investment firm Nextview New Energy Lion Hong Kong Ltd. Earlier in its development phases, fellow Canadian company A.I.S. Resources Limited has been aggressively moving forward on its four main lithium projects in Argentina’s Puna region, including its preparation for drilling on the potentially lithium-rich aquifers at its Chiron project that were recently detected earlier this year. With the lingering uncertainty over how Chile will welcome future foreign investments, there’s good reason to believe that companies like Albemarle (NYSE: ALB), Lithium X Energy Corp. (TSX.V: LIX) (OTC: LIXXF), Orocobre Limited (TSE: ORL) (OTC: OROCF), Sociedad Quimica y Minera de Chile (NYSE: SQM), and A.I.S. 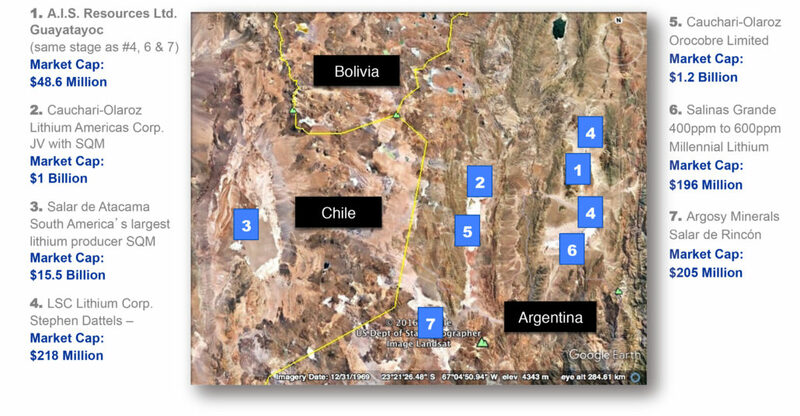 Resources Limited (OTC: AISSF) (TSX.V: AIS) will be fielding more calls on Argentina properties than the Chilean neighbors. Just days after Chile’s regulatory body in charge of lithium production, Corfo, leveled its recommendation against the Tianqi bid, the Chilean development agency reassured the market by stating that companies from Chine, South Korea, and domestically from within Chile, had been approved to make investments of around $754 million into the country’s lithium industry. However, these approvals would’ve been decided over prior to the March 9th announcement of the Tianqi block attempt. The Chinese miner Tianqi hasn’t taken this decision lightly, as they have met with Chile’s top anti-trust prosecutor in an effort sort things out. The 32% stake comes from the forced sale on behalf of Canadian fertilizer company Nutrien, which came from the merger of Agrium and Potash Corp. earlier this year. More Chinese bids are going to come to this region, as the emerging superpower is expected to raise its electric cars production to 7 million units in 2025, up from 1 million last year. Whether deals to secure lithium supplies will all be in the form of the $4 billion deal in Chile, or if it’ll be a smaller deal like the Lithium X deal is still up for grabs. It’s also likely that Chinese buyers will look to up-and-comers such as A.I.S. Resources to hedge their future supplies, given the junior’s massive footprint across all four of its Argentinean lithium projects. With plenty of blue sky on each project, a partnership or outright acquisition is not out of the question in the future. Boasting four significant lithium projects in Argentina’s Puna region, A.I.S. Resources has secured extremely valuable lithium real estate in the heart of South America’s Lithium Triangle. Located on an elevated plateau that lies east of the Andes Mountains, the Puna Region contains one of Argentina’s largest known lithium deposits. Spanning approximately 10,457 hectares, A.I.S.‘s four lithium projects are comprised of Chiron 2,732 hectares, Guayatayoc, 2,500 hectares, Guayatayoc III, 2,725 hectares, and Vilama, 2,500 hectares-All of which are surrounded by large, known lithium deposits, operated by prominent lithium majors. Guayatayoc – the company’s flagship – already has a mining permit, where A.I.S. will soon undergo a TEM-Electromagnetic survey. A drilling permit on the property is expected to be issued before the end of April 2018. The company’s brain trust knows quite a bit about the property already, having already acquired a 2013 PhD study on the property, bringing with it an exploration value worth approximately USD$3 million, and shaving about three years’ worth of work from their timeline. A.I.S. has compiled a NI 43-101 report on the project, and has completed an environmental impact study. Samples from the Guayatayoc returned Li ranging from 270-900 ppm from brine ponds with aquifer flow, and an added bonus of 100-190ppm brines sitting in the top layers. The Guayatayoc Salar shares the same tectonic structure that extends to other well-known salars, such as Salinas Grandes, Pozuelos, Pocitos, and Rincón, which hold the most lithium in the Puna Region. Probably next on the company’s priority list would be the Chiron Project, which consists of four concessions in the Salar de Quirón in the Province of Salta, that other nearby explorers have shown to contain significant prospectivity. Plenty of drilling is already planned, as evidenced by CEO Marc Enright-Morin’s public statements that A.I.S. is sufficiently funded to drill both the Guatatayoc and Chiron properties in the coming months. With valuable real estate in close proximity to high-market-cap neighbours that include properties held by Orocobre, SQM, and others companies worth more than $200 million, A.I.S. has the project space, upcoming news flow, and milestones ahead to provide plenty of growth potential looking forward. Hence A.I.S. is a prime example of the type of company that could entice Chinese lithium buyers either for future purchase agreements of product, a development and production partnership, and/or an outright acquisition in the very near future. Albemarle (NYSE: ALB) Albemarle Corporation globally develops, manufactures, and markets engineered specialty chemicals. The company offers lithium compounds, including lithium carbonate, lithium hydroxide, lithium chloride, and lithium specialties and reagents for applications in lithium batteries, high performance greases, thermoplastic elastomers for car tires, rubber soles and plastic bottles, catalysts for chemical reactions, organic synthesis processes, life science, pharmaceutical, and other markets; cesium products for the chemical and pharmaceutical industries; and zirconium, barium, and titanium products for pyrotechnical applications. Albemarle Corporation was founded in 1994 and is based in Charlotte, North Carolina. Lithium X Energy Corp. (TSX.V: LIX) (OTC: LIXXF) Lithium X Energy Corp., is a resource company operating as a lithium explorer and developer in Argentina and the United States. The company owns a 50% interest in the Sal de los Angeles project comprising 8,156 hectares located in Salta Province, Argentina. Lithium X Energy Corp. was founded in 1997 and is headquartered in Vancouver, Canada. Orocobre Limited (TSE: ORL) (OTC: OROCF) Orocobre Limited explores for and develops lithium and potash deposits in Argentina. Its flagship project is the Salar de Olaroz lithium project located in north-west province of Jujuy. The company also produces boron minerals and refined chemicals. Orocobre Limited is based in Milton, Australia. Sociedad Quimica y Minera de Chile (NYSE: SQM) Sociedad Quimica y Minera de Chile S.A., is a producer of potassium nitrate and iodine. The Company produces specialty plant nutrients, iodine derivatives, lithium and its derivatives, potassium chloride, potassium sulfate and certain industrial chemicals. Its segments include specialty plant nutrients, industrial chemicals, iodine and derivatives, lithium and derivatives, potassium, and other products and services Lithium and its derivatives are used in batteries, greases and frits for production of ceramics. Potassium chloride is a commodity fertilizer that is produced and sold by the Company across the world. Lithium market news – Lithium giant Albemarle contradicts Morgan Stanley on electric vehicle growth. The EV take-up rate, and therefore lithium demand, will be much greater than MS claims. Lithium company news – The lithium deals continue, following Volkswagen’s stunning $25b battery deal with leading battery manufacturers. Welcome to the March 2017 edition of the lithium miner news. This past month saw the stunning $25b battery deal between Volkswagen (OTCPK:VLKAY) and Samsung SDI (OTC:SSDIY), LG Chem (OTC:LGCEY), and Contemporary Amperex Technology Ltd [CATL], as well as the POSCO lithium deal with Pilbara Minerals (OTCPK:PILBF), JR Optimum Nano talks to increase their share in Altura Mining (OTCPK:ALTAF), and CATL’s buy into North American Lithium. It also saw the completion of the Orocobre (OTCPK:OROCF) – Toyota Tsusho (OTC:TYHOY) deal. During March, 99.5% lithium carbonate China spot prices were again little changed, and are down 1.7% over the past 3 months. Global Lithium Carbonate Equivalent [LCE] contract prices are in the range of USD 13-16,000/tonne. USA News Group – A new battery design invented by researchers at the Chinese Academy of Sciences and the University of Chinese Academy of Sciences could help overcome issues limiting the life and safety of lithium batteries. Lithium producers and near term producers preparing to increase global lithium supplies include A.I.S. Resources Limited (TSX-V: AIS) (OTC: AISSF), Galaxy Resources (OTC: GALXF), Sociedad Quimica y Minera de Chile (NYSE: SQM), and Lithium X Energy Corp. (TSX-V: LIX) (OTC: LIXXF). The findings by the Chinese researchers are fanning the expectations of demand for lithium in an already undersupplied market. A new lithium junior player that could benefit directly from the new demand for lithium is A.I.S. Resources Limited (TSX-V: AIS) (OTC: AISSF), which could answer the call to add new supplies from its South American lithium brine Guayatayoc project as early as 2019. Other lithium companies that are moving to increase supplies for the onslaught of new consumption include Galaxy Resources (OTC: GALXF), Sociedad Quimica y Minera de Chile (NYSE: SQM), and Lithium X Energy Corp. (TSX-V: LIX.V) (OTC: LIXXF), all of which have begun massive expansion of their lithium resources. Lithium-ion batteries, while very reliable and popular for consumer electronics have their own imperfections related to safety and deterioration of battery capacity over time. The main culprit in both of these issues is dendrite formation. Dendrites, which build up over time inside the battery cells, can cause battery fires and were in fact one of the issues that were identified as the cause of Galaxy Note 7 spontaneous combustion in 2016. A new battery design invented by researchers at the Chinese Academy of Sciences and the University of Chinese Academy of Sciences could help overcome this problem. The researchers have come up with a lithium-metal battery design, which is capable of suppressing dendrite formation, hence creating safer and longer lasting batteries. The new design also eliminates a common conundrum that afflicts conventional battery configurations. Existing methods to reduce dendrite growth often lead to resistance at the electrode/electrolyte interface and vice versa. This new method is capable of dealing with the two problems at the same time. In comparative tests conducted by the researchers, it was found that after 1750 hours of charging and discharging, conventional Li-ion batteries had rough morphologies that indicate dendrite formation. On the other hand, batteries made using the asymmetrical electrolyte showed no morphological changes after 3200 hours of the same treatment. This indicates that the latter configuration had been successful in preventing dendrite growth. That’s very big news for lithium battery developers and producers alike. Although there are enough verified lithium resources to sustain a fully EV dependent world for hundreds of years, slow establishment of mining operations has meant that actual supply has lagged behind demand. And now that the Tesla-led EV revolution has hit full gear, pressure on existing resources has grown by a considerable factor. Not to be left out of the competition, junior resource companies have grasped the seriousness of the demand for lithium and are moving to bring on supplies. A.I.S. Resources Limited is one of these early movers with excellent prospects in South America’s productive regions. Argentina is a major global lithium producer with significant additional potential, and a respected mining-industry history. The country has become well known for its many mineralized salars or salt fields, which include the Hombre Muerto and Salar Olaroz properties each producing significant lithium. This is where A.I.S. Resources has staked its three main lithium projects, all of which are strategically located in the Argentina’s Puna Region. In all, A.I.S. Resources has about 7,725 hectares and its flagship Guayatayoc property is well advanced with a mining permit in hand and drilling permits imminent. Guayatayoc was sampled and returned Li ranging from 270-900 ppm in ponds that had aquifer flow, as well as 100-190ppm for brines sitting in the top layers. That’s considered very high grade and suitable for li-ion battery production. The Guayatayoc is on its way to becoming a near term producer. The project will be fast-tracked, as chemistry and process work is already complete. The company expects that it can be in production as early as 2019. And that comes from a highly skilled team of lithium mining veterans who have completed other recent lithium projects into production. If successfully developed to market, this new dendrite technology will help to accelerate the adoption of battery run technologies across the spectrum, including electric vehicles and home battery power. By eliminating some of the biggest concerns that people have with electric vehicles, companies like Tesla and EV farms of top vehicle manufacturers stand to gain massively. The technology will be particularly useful in electric vehicles. EV batteries are very expensive and therefore cannot be viably changed in the same fashion as in smartphones once depleted. Because electric vehicles have not been around for long, there is still uncertainty about the longevity of their batteries. And because the battery is an extremely critical component of EVs, it stands to be seen whether they can stand up to the longevity offered by petrol and diesel vehicles, which often exceeds 30 years. Technologies such as this will therefore be crucial if the EVs are to compete with combustion engine vehicles. Galaxy Resources (OTC: GALXF) Galaxy Resources Limited is a lithium-focused resources company, with assets spanning Australia, Canada and Argentina. 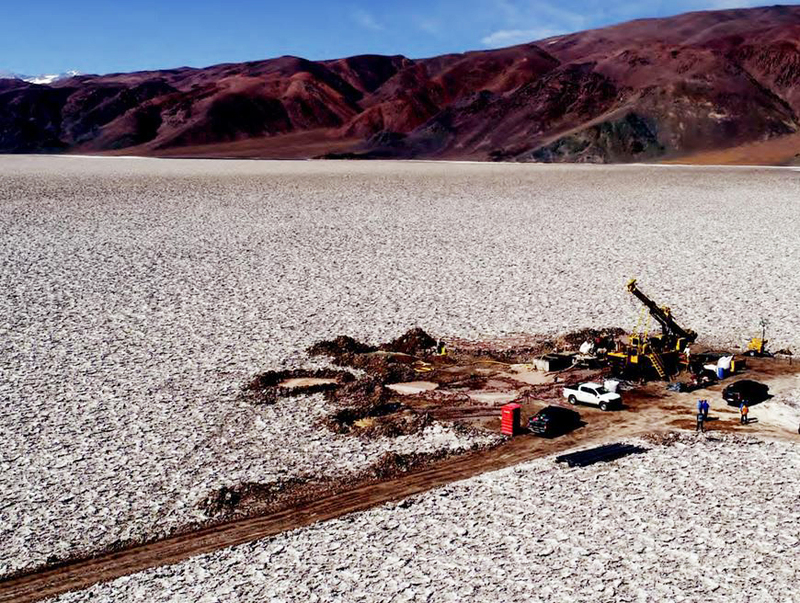 Galaxy is currently advancing plans to develop the Sal de Vida Lithium and Potash Brine Project (“Sal de Vida“) in Argentina, which is situated in the Lithium Triangle, a region where Chile, Argentina and Bolivia meet. Sal de Vida is a proven high quality resource has excellent promise as a future low cost production facility. Galaxy also owns the Mt Cattlin Spodumene Mine near Ravensthorpe in Western Australia and the James Bay Lithium Pegmatite Project in Quebec, Canada. Lithium X Energy Corp. (TSX-V: LIX.V) (OTC: LIXXF) Lithium X Energy Corp. is a lithium exploration and development company with a goal of becoming a low-cost supplier for the burgeoning lithium battery industry. On July 11th, the company announced that further to its news release of June 29th, 2017, the Company has closed the definitive agreement with Aberdeen International Inc. for the purchase of Aberdeen’s remaining 50% interest in Potasio y Litio de Argentina S.A., which controls 100% of the Sal de los Angeles Project. The project consists of 8,154 hectares covering 95% of Salar de Diablillos, and has an NI 43-101 mineral resource estimate of 1.037 million tonnes of lithium carbonate equivalent in the indicated category and 1.007 million tonnes of lithium carbonate equivalent in the inferred category. Mr. Thomas shares his views on lithium supply and demand, as well as his thoughts on the lithium sector as a whole. He also gives an update on AIS Resources as well as his outlook for the company. The Company’s primary focus is on their flagship Guayatayoc lithium brine project, and their Quinos salar Chiron project in Argentina. Phillip Thomas, BSc Geol, MBusM, MAIG, MAIMVA, (CMV) has spent the past 12 years exploring for lithium brines, building and operating lithium carbonate pilot and production plants, and building production and processing facilities. He has firsthand experience with the highly technical process of operating a lithium carbonate/lithium chloride plant at the Rincon salar. 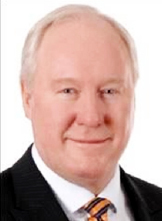 He was Chairman and CEO of Admiralty Resources from 2004 to 2008, where he and his team explored the Rincon and other salars and built the lithium carbonate processing facility which commenced operation in 2007. Upon the sale to the Sentient group in 2008, he resigned to pursue other lithium development opportunities. He and this team developed the Pozuelos salar producing an indicated and inferred resource, and putting in two production wells. They also put together a fully equipped lab and pilot plant in Salta to manage the extraction processes and phase chemistry including fractional crystallization, membranes and ion exchange processes. At Hombre Muerto salar they trenched, drilled and constructed lithium isobars. Most recently he’s been involved in exploring the Pocitos, Salinas Grandes and Guayatayoc salars. He is an experienced lithium brine Geologist both in the field and has written bankable feasibility studies and proven and probable reserve estimate statements. Has significant investment banking experience holding senior executive/director roles with Macquarie Bank, ABN-Amro, McIntosh Securities and actuaries Watson Wyatt. What are your current views on the lithium industry? Can you please give your views on supply and demand issues, industry consolidation, and on current and future lithium pricing? The current spot market for lithium carbonate above 99.2% is very strong. I saw a recent tender at $21,800 per tonne. As far as production goes, no-one has declared letting a procurement, engineering, construction contract (including us) so there is a lead time of approximately two years to reach production. There are processing technologies being experimented with at lab bench scale but it’s a long road to commercial production. To date no-one has proved a more streamlined solution being economically competitive than ion exchange and fractional crystallization which is what we have proved. 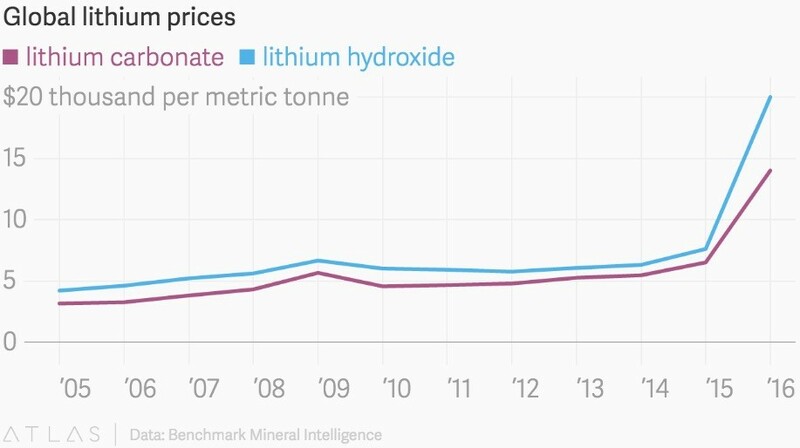 Lithium Oxide production is expanding rapidly and this will probably be the next major source of lithium carbonate and lithium hydroxide, but at a price premium. However there are nine gigafactories building six different types of battery technologies, and given this I expect the market to be in deficit for at least five years if not longer. In Norway 52% of new car sales were hybrids or EV and I think this is a trend that will permeate Europe. China also has its own incentives for hybrids and EV’s. High electric density batteries are absolutely required for these cars and the best technology to date is the cobalt manganese lithium battery. The 27,000 electric buses in China use a lower grade battery but they are also big consumers of lithium carbonate to build these batteries. Carbon/Iron batteries were developed on the lab bench recently and they promise to drop the price, and increase electric density. However, this will take quite a few years but it’s a trend. 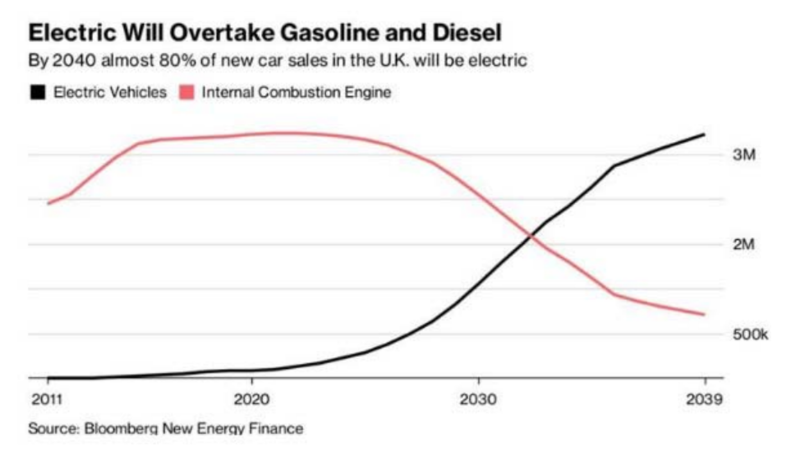 Glencore, commissioned CRU to conduct research into what 30 million sales of EVs by 2030 would mean. “As early as 2020, forecast EV related metal demand is becoming material, requiring an additional circa 390,000 tonnes of copper, circa 85,000 tonnes of nickel and 24,000 tonnes of cobalt,’’ Glencore’s investor presentation said. That implies more than 100,000 tonnes of lithium carbonate at a high grade will be required annually. The industry will consolidate very quickly as in Argentina not many junior explorers have the skill, expertise and processing skill to produce lithium carbonate or lithium hydroxide at a low price. The are no phase chemistry diagrams for lithium, sodium, magnesium, calcium that have been published that operate in a high saline environment. This is a major hurdle. In Chile it is at the behest of the government policy and what protection mechanisms the politicians put in place to protect SQM. Lithium was considered a strategic metal in Chile and the government has held production licences very closely. I don’t think this situation will be resolved in a commercial sense for quite a few years. I have worked in Chile since 2004 and have a sense of the politics. What is AIS Resources currently working on in regards to your flagship Guayatayoc lithium project and what stage are you at? When do you expect to announce a compliant resource estimate and complete your BFS? Please include any off-take partner discussions. As you know we have two projects Guayatayoc and Chiron. 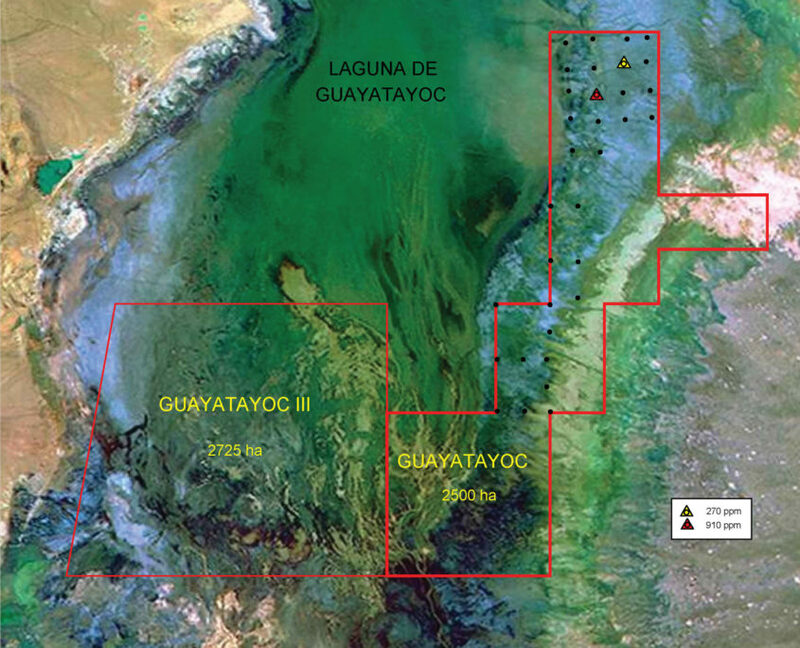 Guayatayoc is waiting for the final UGAMP meeting in early first quarter 2018, and then we expect our drilling permit to be issued, the first one ever issued in Jujuy province we think. Dr Solar who is head of the Mines department has been very helpful. The government has been working closely with all 23 provinces to ensure the Macri goals of developing Argentinas natural resources is achieved. Morales who is the Govenor of Jujuy is also keen to see progress quickly to encourage employment and revenues. We have some superb 2D seismic data and interpretation from Dr Steinmetz PhD thesis from 1995 till recent analysis. Then we have Steinmetz and Galli’s work in 2015 which ties in the stratigraphic, tectonic, basin development and dating information in Guayatayoc and Salinas Grandes. So once we get our drilling permit we will produce an inferred and indicated mineral resource statement, and once production testing is completed a measured mineral resource statement followed by a proven and probable reserve statement and the banking feasibility study. A US$2m budget has been set for this work including drilling and the VES seismic work which needs to be completed. At Chiron we have our seismic and drilling permits so we will be starting seismic on 10th January and probably 8 drill holes of about 3,200 metres in total and then produce a inferred and indicated mineral resource estimate. Regarding takeoff contracts we have been having discussions with a number of parties in China, Taiwan, Japan, Korea and Europe. One party has been to Guayatayoc and inspected the property and our laboratory facilities. We also have been producing samples and have a a few kilos of greater than 99.2% and 99.6% Lithium Carbonate. Later in the year we will target the LPF6 producers, the gigafactories and others. We have been approached by a number of brokers as well. To fund the project we have designed a virtual equity style contract which will enable us to use the credit of the takeoff contract with the debt/equity piece. The cost of the 8,000 tonne per annum project is estimated at “C Class” to be just under US$100m. What do you see as the main catalysts for AIS Resources going forward, and where do you see your company being in one and in five years? What are your production targets (I read a target of 8,000tpa LCE) for Guayatayoc? Can investors expect to see a higher target going forward, perhaps 16-20,000tpa? We have a detailed Gantt chart month by month in our presentation, but we expect over the next twelve months to get to the point of having a Proven and Probable mineral reserve statement, a bankable feasibility study, completed engineering, procurement and construction contracts and drawings and permitting to complete pond construction. In 2019 we expect construction to be completed and the brines in some of the ponds ready to process in the commissioning stage. Depending on the grade of lithium brines we pump, which is set at about 300ppm at the moment we will get 8,000 tonnes a year. If we get 400ppm we will get close to 11,000 tonnes a year. For this we need to pump about 700 litres of brine per minute which should be easy out of three production wells that are close to 200 metres deep. That’s just 233 litres per well per minute. All you need to do is dig a 2 metre deep hole and the brine fills it in 10-15 minutes, so we expect the hydrostatic pressure to be much greater at depth. In five years we will hopefully have our clients requesting 20-25,000 tonnes a year and we would have expanded the processing foot print. The nice thing about our process is its modular and easily expandable. The plant footprint will be built to 16,000 tonnes but we will only put 8,000 tonne of processing gear in. That’s our concept at this stage but its going to be an interesting 12 months. Do you think AIS Resources is currently fairly valued, undervalued or overvalued by the market? Where do you see your company and the stock price being in 5 years? Being a Certified Mineral Valuer and having twelve years experience as a stockbroker and fund manager I’m not sure where to start. Its clear we have some risks in terms of permitting and locating drill holes on Guayatayoc to produce 700 litres per minute of brine. This risk is a hydrogeological risk, because we know the brine is there. It’s a matter of locating the best production holes. So say we get it totally wrong and have to drill another 14 holes its going to be a $700,000 risk. However given the huge amount of data we have and more than 20 man years studying the basin this is unlikely to eventuate. My view is the market hasn’t priced in our ability to develop the project quickly. So we are lagging other explorers. You don’t have to be a maths genius to work out that if we have 100 million shares on issue and an economic value of $60 million, and a margin contribution of $100,000,000 at $10,000 per tonne (being $1 per share) using a price earnings index of 10 times you get $10 per share. However there are much more rigorous methods of computing the lower and upper quartile share market ranges and I would encourage your readers to go to www.aimva.com.au to look at some of the data and methods on this website of the Australasian Institute of Mineral Valuers and Appraisers. Could you please comment on AIS Resources other lithium projects such as Vilama and Quinos Salar, and any other acquisition and your processing plant plans? We were very excited when we sampled Vilama because of the great values of lithium on the surface, good ratios of lithium to magnesium, the flat terrain, the absence of wild life and the proximity to the volcanic chain that runs along the Argentina/Chile/Bolivia border which is about 5 kilometres away. It was initially a struggle breathing at 4,500 metres but we got used to it. 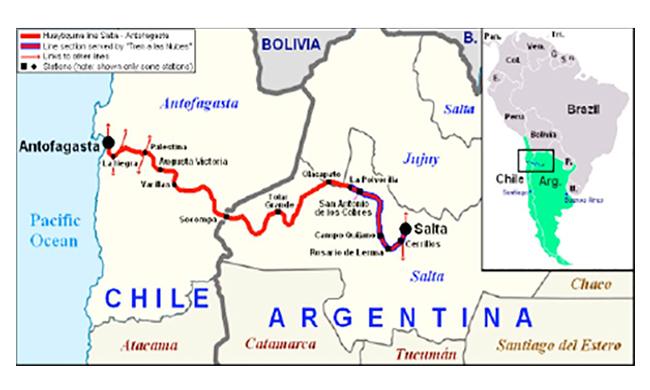 The salar is located close to another salar but the road needs extensive refurbishment on the Argentina side between it and Susques a major town about 100km away. On the Chile side the government is actively renovating the road which we saw when we last visited. At this stage we have our hands full with Chiron (Quinos salar) and Guayatayoc so we will complete the seismic then the drilling at Chiron. Then we will be able to estimate how much brine we can contribute to the Guayatayoc plant. Guayatayoc has gas, 240v and 415v electricity, labour only 30km away and existing fresh water spring 3 km from the road. Would you like to add anything that you think investors should know about AIS Resources? Our team is working hard on permitting, exploration, mineral brine estimates, feasibility studies, phase chemistry and processing technology all at once. We are not doing it in a sequential manner. Therefore I think we are way in front of most junior explorers as they haven’t started some of the pieces we have already completed as they are approaching it as sequential process like a copper mine. The talent we have on board have deep experience, highly educated, and have got their hands dirty doing the work two or three times, which counts for a lot. There are countless examples of explorers claiming processes that didn’t work, or copying patents that don’t work in a commercial setting. The fact lithium can change its valency in different chemical settings is one small example of some of the issues to contend with. Many business development/investor relations people have no concept of the difficulty and complexity and unless you have been in the CEO role you tend to underestimate the challenges. Our lithium production will be tailored to the market we can dominate, and the grade is as important as the lack of deleterious impurities and we will focus on this. Back in 2007 we did an ISO17045 audit and held certification for ISO and we will do this again. Dr Carlos Sorentino, our chemical engineer has made a significant contribution and I believe he is one of the very few people who truly understand this business at the level required to produce successfully. Having access to a laboratory, and pilot plant has made our task much easier and saved us many months of testing. Investors can view the latest company presentation here. Disclosure: I am/we are long AIS Resources (TSXV:AIS). I wrote this article myself, and it expresses my own opinions. I am not receiving compensation for it. I have no business relationship with any company whose stock is mentioned in this article. Additional disclosure: The information in this article is general in nature and should not be relied upon as personal financial advice.